/ How to install Magento on WAMP server localhost/localcomputer ? In this post I will show you how to install Magento on WAMP server in your local computer. Installing Magento on WAMP can be pretty painful for beginners, as Magento requires a lot of server configurations which are not set by default. Install and start the WAMP server. Make sure that your wamp icon is green, if it’s not green then it’s not active. 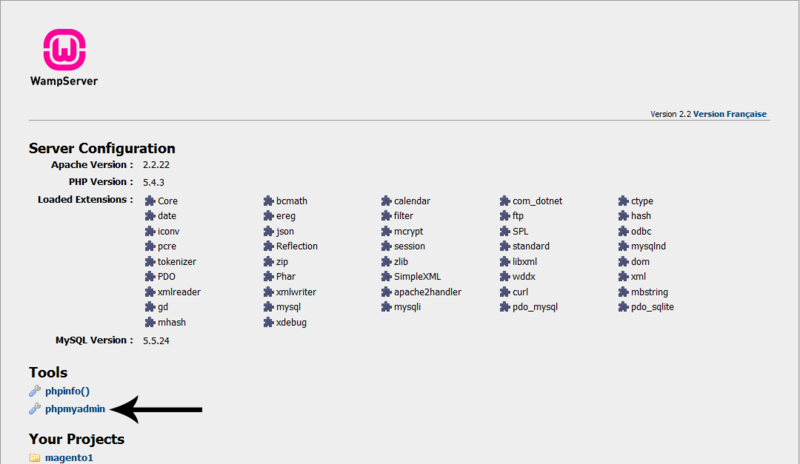 Open any browser and type localhost or 127.0.0.1 on the address bar and you will see your WAMP server dashboard page. You can download magento community edition from this link. You can select your format of choice and download. Now that you have the server all set, you can start the process of installing Magento. Extract the downloaded Magento file. Inside the extracted file you will see a folder named “magento”. You have to copy this folder in the root directory of your WAMP server. To get to the root directory, click on green WAMP icon and click “www directory”, your server root directory will open up. Copy the “magento” folder in this directory. Ok, so now you have the magento files ready for installation. But before you start installation, you have to create database for your site. 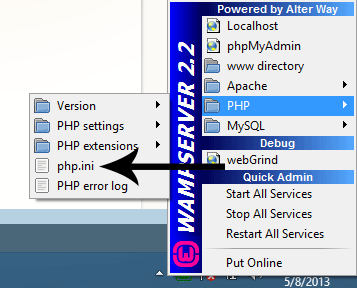 In your WAMP server Dashboard click on phpMyadmin link in Tools section. 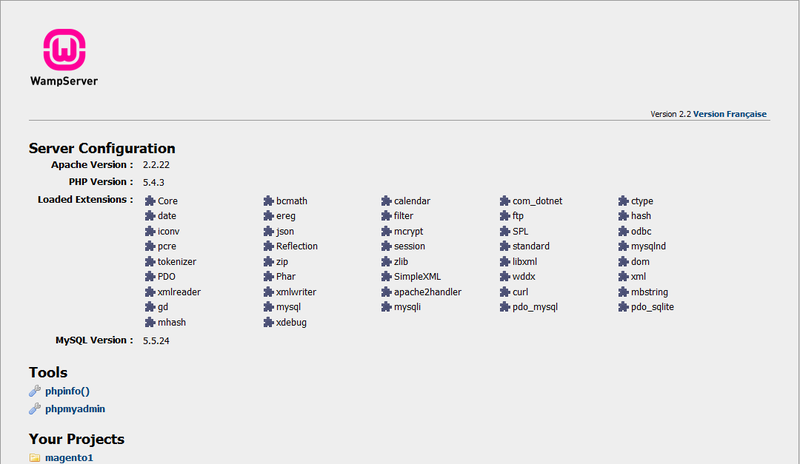 This will open the phpMyAdmin Page. 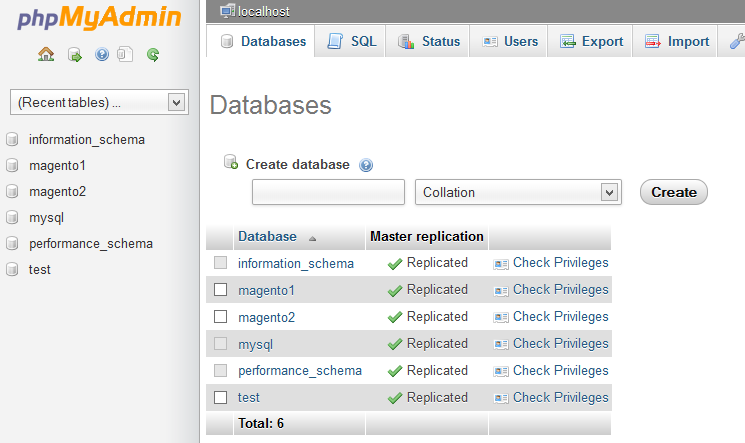 Click on the database tab and type in the database name (suppose we name it magento1) and create the new database. Your database creation is complete. For error-free installation you have to change some settings of your WAMP server. Click on your green WAMP icon -> PHP -> PHP extensions -> php_curl (at the top of the list) and click on it to make it active. 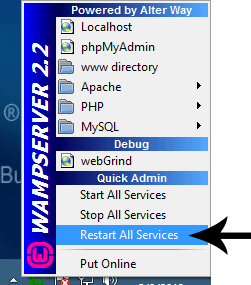 Click on WAMP icon and Restart all services. Click on WAMP icon -> Apache -> Apache Modules -> rewrite_module(towards the bottom of the list). 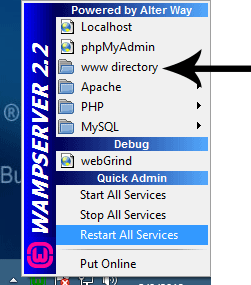 Click on WAMP icon and Restart all services. This will open up your php.ini file in a text editor. Search for “ max_execution_time “ in the file and you will find something like max_execution_time = 30 , change 30 to some arbitrary large value such as 1500. This change means we are changing the Maximum execution time of our server from 30 seconds to 1500 seconds. Similarly search for “ max_input_time ” and you will find “max_input_time = 60 ”, change 60 to 1500. Save the php.ini file. Now you are all set to install Magento. Click on WAMP icon and Restart all services.Wait till the icon turns green. 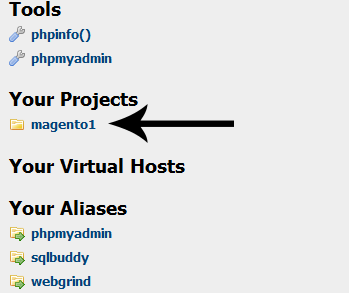 Open your WAMP dashboard and click on Magento folder in Your Project section. 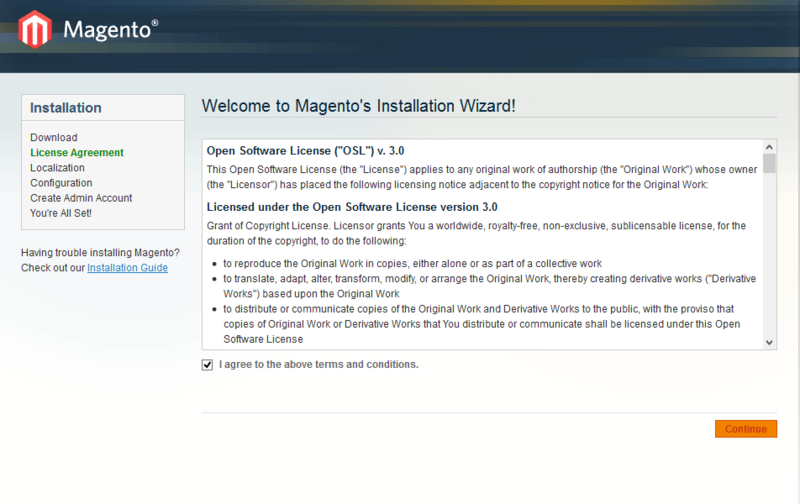 The Magento installation wizard opens up. Accept the terms and conditions and click on continue. The Localization settings page appears. No need to change anything here, you can change settings from backend later. Next, the Configuration settings page appears. You have to give the Hostname which will be “localhost” in this case. The Database name would be the one that we created earlier. User Name should be the Database username. If you haven’t changed anything then it should be “root” and the password section would be blank. Keep others as it is and click on continue. 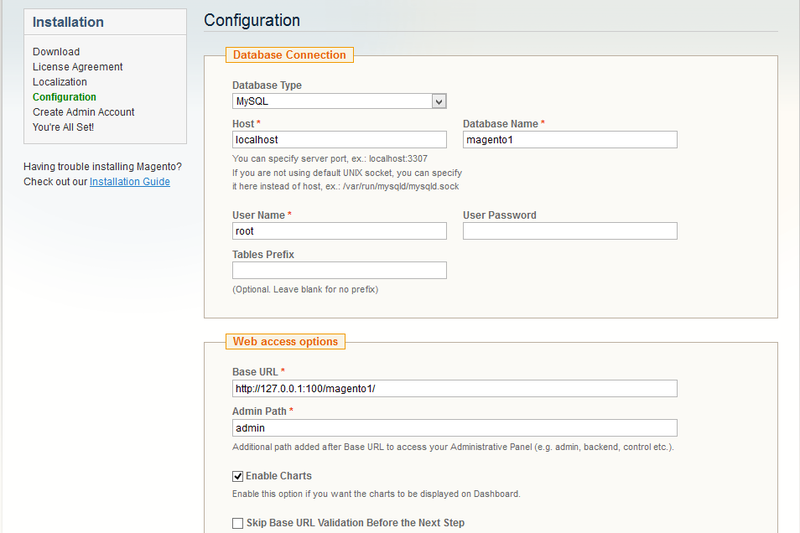 This step will take some time as Magento will be creating the Database Tables. After this the Admin Account creation page appears. Fill in the details and remember the Username and Password, it will be required to access the Admin section. You can leave the Encryption Key section Blank. Click on continue. That’s it. You are done and have set up your first Magento Webstore. If you face any other issue while trying to install Magento on WAMP, please feel free to post it in the comment and I will be more than happy to help you. If you want any other Magento related post you can request that too. I will try my best to write a post on your requests. Keep an eye here for the upcoming posts. I am a Magento developer at InSync and spend most of my time reading books(weird ones). Ask me anything on Twitter @SubrataBauri and I will answer it personally.